The first thing you need to know is that you don’t have to be a gardening expert to join the club, just have an interest in plants and gardens. The gardening club meets on the first Thursday of most months in the village hall. For a small fee of £15 per year you will receive a programme of speakers and organised visits. 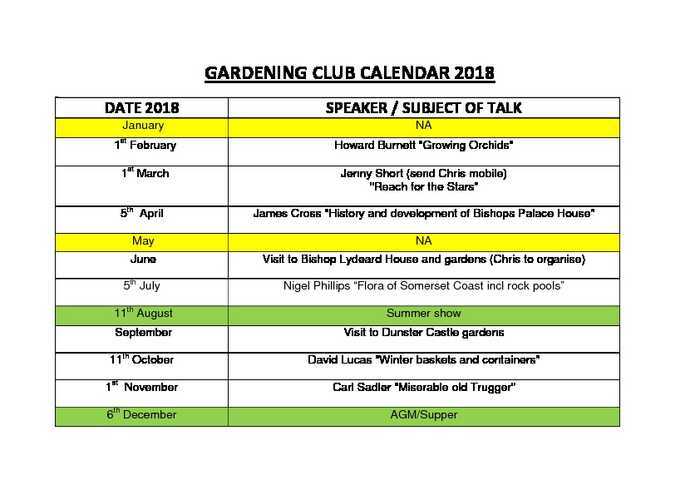 Our speakers are of good quality and cover a range of gardening topics usually based upon their own extensive experience. Last year we had talks as diverse as the history of the cottage garden, stumperies and the growth and use of herbs. This year we have visited Bishop Lydeard House and gardens and plan to visit Dunster NT gardens. We offer anyone who is interested in joining a free first visit so they can decide whether it is the type of club that appeals to them. Every year we hold a show which is open to everyone. There are 5 sections -vegetables, flowers, fruit (including jams), cookery, crafts and a section for children. Exhibits are judged by experienced outside judges and points awarded. The entrant with the most points for each section is awarded a cup which they keep for a year. After judging, the show is open for viewing. There is always a great atmosphere and refreshments to enjoy. We also challenge entrants to grow a seed potato in the great Potato Challenge. The winner is the entrant with the highest weight of potatoes on the day of the show.